The field of interior design focuses on designing and developing a visually pleasing, safe and energy efficient environment that meets a customer’s particular needs. Professionals in the field of interior design draw upon their creative abilities and technical knowledge to come up with designs as simple or as complex as a client specifies. They ensure the maximum use of space and a high level of functionality while not compromising on safety or comfort. Interior designers are no longer limited to working in homes or offices; in fact, today they design entire buildings, shopping malls, amusement parks and even work as town planners. What kind of education do I need for a career in interior design? Depending on your short and long term goals, you can obtain a diploma or a degree in interior design from a number of colleges around the country. The degrees on offer include associate’s and bachelor’s degrees, and can be completed on-campus or online. Students normally take courses in architecture, computer aided design, landscaping, furniture design, ergonomics and building safety codes. What are the different careers in interior design and what are the future prospects? Those who wish to make a career in interior design can work as home or office interior designers, furniture designers, safety inspectors, landscaping designers and architectural advisors. 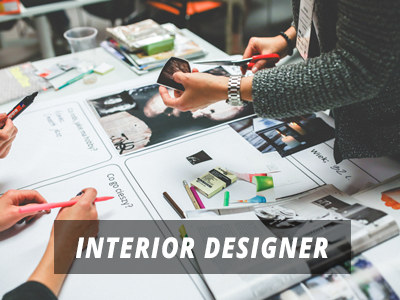 According to the Bureau of Labor Statistics, employment opportunities for interior design professionals will increase by more than 19% through 2018, which is one of the highest growth rates among all occupations. Average starting wages currently stand at $35,000 while more experienced designers providing specialized services earn as much as $150,000 per year. Q:How can I become a certified interior designer? A:To be a certified interior designer, you will need to acquire a formal degree from an accredited institute like Collins College, New York School of Interior Design and Academy of Art University. You can pursue an Associate, a Bachelor or a Masters Degree in Interior Designing. Q:What are the major job responsibilities of students enrolled in interior design internships? A:There are a number of job responsibilities and tasks expected from students in interior design internships. The main duties expected to be performed in internships are: update price lists and information from vendors, filing and handling databases, assist designers with their jobs, assist office manager with administrative tasks, contact suppliers, prepare presentations and drawings, and schedule appointments. Q:Are there internships for interior design degree holders? A:Yes, there are many internship opportunities for interior design degree holders. Many design colleges include an internship program in their curriculum which gives students the opportunity to gain practical experience. Some colleges that offer internship opportunities after degree completion are: Houston Community College, New York School of Interior Design, the Art Institute of Pittsburgh, and the American Intercontinental University. Q:As I read about the future of interior design jobs, there was mention of the course on Basics of Textiles. What are the contents of this course? A:It is common to get to read about the course on Basics of Textiles while going through the future of Interior Design jobs. This course is worth 3 credits in total. It is designed to offer students with ample understanding of the various types of fibers and difference that can be achieved in man made fibers. Students are also highlighted on the various knit and stitch that can be achieved manually. Q:Can you tell me about the future jobs in interior architecture? A:You can have a number of job options related to the field of interior architecture. You can choose to be a home or an office interior designer. You can also opt for other related jobs such as furniture designer, landscaping designer, safety inspector, and architectural advisor. In order to grow in the field, you will need to gain experience and provide specialized services. Q:What degree should I have to lead a successful career in interior design? A:A bachelor degree is enough to get you into the professional world of interior design. You can qualify for a number of entry level job positions with this degree. If you wish to pursue high paying careers, having a master's degree is necessary. Certifications are also beneficial and can help boost a interior designing career. Q:I want to learn about Interior Design career jobs and how much they pay. Can you tell me? A:Interior designers are skilled and trained professionals who the interior of homes, offices, and other buildings. This field of designing is on the rise and is expected to grow at a fast rate in the coming years. According to the US Bureau of Labor Statistics, the annual median income of interior designers is $47,600. Q:Can you tell me the benefits of a business degree for career in interior design? A:A business degree can be a good option if you want to pursue a career in interior design. Career designing requires organization, management, and communication skills. A business degree can train students in all these skills and can also help them set up their own business. You will also learn to manage your finances with the help of a business degree. Q:Can you name a few alternative careers for interior designers? A:Not everyone with an interior design degree pursue a career as an interior designer. There are alternative career paths one can look forward to with education in interior deigning. These include: home stager, set designer, industrial designer, and more. The career options with interior designing education are vast and dynamic. Browse through our page for more information. Q:Are there jobs in interior architecture? A:According to BLS, job opportunities for interior design professionals will increase by more than 19% through 2018, which is one of the highest growth rates. With a degree in interior architecture, you can work from home or office. You will have a number of job options such as interior designers, furniture designers, safety inspectors, landscaping designers, and architectural advisors. Q:Can you tell me what are the basic interior design intern responsibilities? A:Most interior designer start off their careers as interns. Internship programs are geared towards providing newcomers in the industry to acquire hands on experience and work with senior designers. The job tasks may include assisting with client concerns, scheduling appointments, managing files, and participating in different design projects. Take a look at our page for more information. Q:Are jobs with a degree in interior design degree worth it? A:According to the US Bureau of Labor Statistics, interior designers make an annual median income of $47,600. The demand for interior designers is also on the rise. This can be a suitable career choice if you enjoy designing and want to work in a field that requires creativity. Take a look at our page for more information about these careers and programs. Q:Are there any well-paying careers for interior design majors? A:Individuals with majors in interior designing can look forward to career as an interior designer or assistant. These professionals basically design interior spaces for homes and commercial buildings. Interior designers can work with architect firms or work as self-employed. In fact, many individuals are working as self-employed interior designers and offer services to clients. According to the US Bureau of Labor Statistics, the median income of interior designers is $47,600. Q:While searching about 'future for interior designers' I came across online courses. Can you give me the details? A:Online programs are also available in interior design, for students who cannot afford to acquire on campus education. However, it is important that you look for accredited programs, to get quality education and safeguard your career prospects. Online programs are convenient and cost effective, yet require greater responsibility on your part. Q:How can I find lucrative careers in interior design? A:In order to find good career opportunities in interior design, it is recommended that you complete your education from an accredited institute. A higher level degree in interior design will help you get better job opportunities and career growth. Relevant experience and training under the supervision of an expert can lead to a good start to your career.